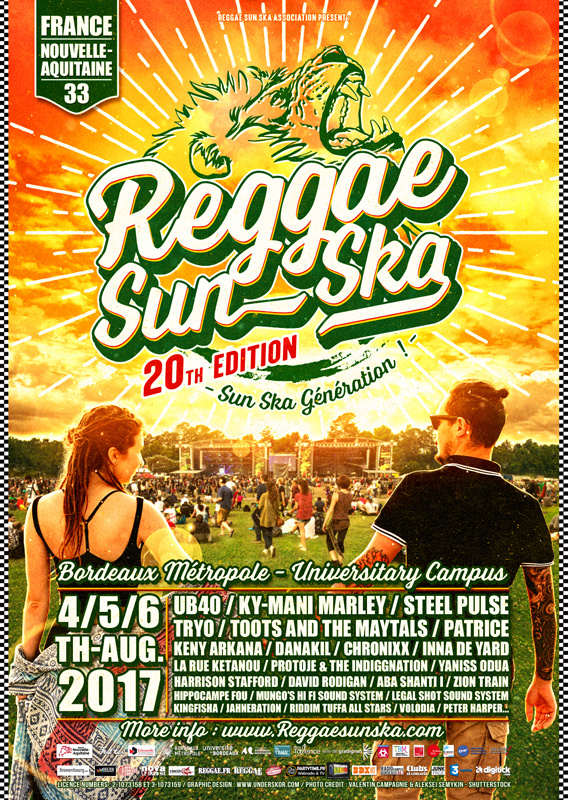 4,5 and 6th of August lets celebrate together the 20th's Edition of the Reggae Sun Ska Festival at the University Campus of Bordeaux. We’re following the first reggae festival in France’s organisation which will be as you could understand it full of good music and legends! Cause in term of legends the festival is very proud to welcome this year TOOTS AND THE MAYTALS mythic band from Jamaican scene since the 60’ with his charismatic rock singer Toots Hibert. Talking about legends... INNA DE YARD with the most amazing Jamaican artists! KY-MANI MARLEY, STEEL PULSE and UB40 will also be present at the amazing 20th edition of the Reggae Sun Ska Festival. For 20 years Reggae Sun Ska is making a point of programing the biggest stars but supporting new talents too cause reggae scene is always moving. PROTOJE & THE INDIGGNATION and CHRONIXX are part of the young “reggae revival” Jamaican generation who knew how to renew reggae music and led it beyond stereotypes. Bothhave a planetary success and will proudly represent this new aesthetic named “nu-roots”. Reggae Sun Ska always had a sharp eclectic and bold line up with the purpose of sharing reggae music with the widest possible audience and show how this music is rich and hybridas the others. So, it seemed logical to invite one of the most talented musician of this musical mix: the exceptional PATRICE who is mixing reggae sounds with ingenuity for 16 years. And PETER HARPER will bring his folk sound with sensitivity and poetry. About the Dub Foundation the Reggae Sun Ska is continuing their work for the promotion of a music and state of mind which are totally linked to the festival. ZION TRAIN Live Dub English pioneers are a real source of inspiration for the electro/dub scene for 25 years and will play their album “Live As One” which had been rewarded by a Grammy Award! RIDDIM TUFF ALL STARS will mix historic hits from the 80’ with the mcs El Fata, Lasai and Tenja. French from ROOTS RAID will offer pure moments of analogic music enriched by the Mighty Cricket and Little R’s voices. DADDY WHITIE and THE SUBVIVORS will represent French scene too showing with success how it’s always moving and conquering a large audience. Music is changing feeding with new influences but the message is still the same. An engagement for tolerance and unity, to offer a gateway to the world to new cultures and social engagements. Don't miss the 20th edition of Reggae Sun Ska festival 2017!